A muscular young man with a strong profile, who looks fully destined to kill a giant and to reign as Israel's king, this David is no innocent boy with a slingshot. Carelessly cradling Goliath's huge, severed head with one arm and his oversize sword in the other, he gazes off into the future. Pietro Novelli set David against a blank background, pushed his three-quarter-length body up close to the picture plane, and portrayed him as a common man rather than a patrician, following Caravaggio's famous examples. 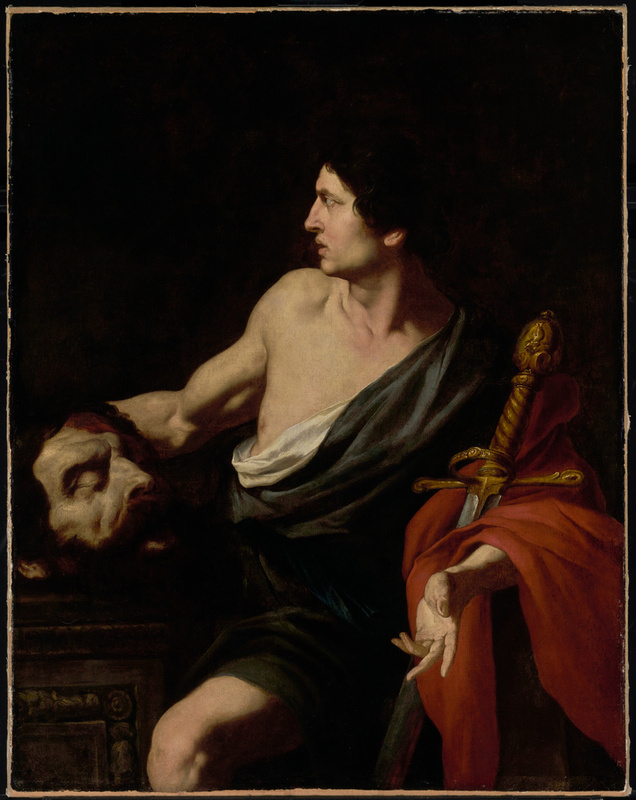 He followed Jusepe de Ribera in using a dark palette, portraying David as an individual rather than a generic common man, and emphasizing the ghastliness of Goliath's head. Novelli probably painted this picture during his time in Naples, where these dramatic contrasts of light and shade were typical. Sotheby & Co., London. Catalogue of Important Old Master Paintings. July 12, 1972, p. 68, lot 118. Peintures italiennes du Musée des Beaux-Arts de Marseille, exh. cat. (Marseille: Palais Longchamp, 1984), p. 85, under no. 48, entry by Christiane Swaton-Escoffre. Herding, Klaus. Review of Pierre et François Puget, peintres baroque, by Marie-Christine Gloton. The Burlington Magazine129, no. 1014 (September 1987), p. 600, fig. 42. Brejon de Lavergnée, Arnauld. Musées de France: Répertoire des peintures italiennes du XVIIe siècle (Paris: Éditions de la Réunion des musées nationaux, 1988), p. 244. Pietro Novelli e il suo ambiente, exh. cat. (Palermo: Albergo dei poveri, with Flaccovio, 1990), pp. 260-61, no. II.38, ill.
Bonaccorso, Maria Tèresa. "L'ultimo dei grandi sulla mostra 'Pietro Novelli e il suo Ambiente.'" Quaderni dell'Istituto di storia dell'arte medievale e moderna, facoltà di lettere e filosofia Università di Messina 14 (1990), p. 32. Cicala, Francesca Campagna. "Considerazioni sugli esordi di Pietro Novelli tra Roma e Napoli." Storia dell'Arte 75 (May-August 1992), pp. 186-87n13. Jaffé, David. Summary Catalogue of European Paintings in the J. Paul Getty Museum (Los Angeles: J. Paul Getty Museum, 1997), p. 92, ill.
Lang, Walther K. Grausame Bilder: Sadismus in der neapolitanischen Malerei von Caravaggio bis Giordano (Berlin: Reimer, 2001), p. 324n775.